Along the path to adulthood I knew I was making progress when I gave up certain habits. Like the day Pop Rocks and Fun Dip stopped being a part of my regular diet. Or the first winter I went without tossing snowballs at the school bus. You know, signs along the path of life that make one feel like a grown-up. Occasionally I wonder if I’ve taken a wrong turn somewhere because I can’t stop at a gas station without buying beef jerky. But it was expensive. I’d save a few bucks by mowing lawns in the summer or shoveling walks in the winter that I’d have enough to buy the long skinny jerky sticks at George’s Market off 36th Street in Ogden. When I started playing baseball I graduated to Jerky Stuff. It came in what looked like a tin of chewing tobacco but was filled with 97% fat free goodness. I’d place a pinch in my lip till the flavor was drained or I accidentally swallowed it. Usually the latter. I can’t imagine the money I’ve spent on beef jerky over the years. Probably enough to buy a cow or two. I am the complete opposite. When I was a kid I would see the beef jerky and cringe. You could not have paid me enough money to try it. Then when I got older I tried it at some point and realized I liked it. I actually just bought some this week because I thought it was a perfect snack to bring ice-fishing. 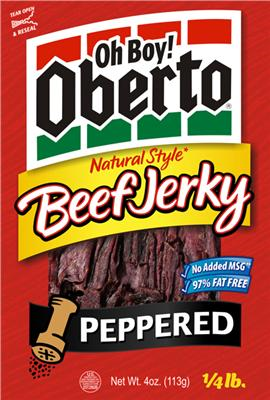 So, when I eat beef jerky – I feel like a grown up. I realized when I was reading Calvin and Hobbes, playing video games and eating a Pop Tart at the same time, that it was time to grow up. One of these days, I will get around to it. Brett, do you remember the smell of George’s Market? It had a really unique smell and I can’t really explain it. I was really disappointed when the name was changed to 36th Street Market. What happened to George? He was like an institution in Ogden even though nobody ever really knew him. At least I don’t recall a George working at the counter, unlike Jun’s Market on Harrison where you knew Jun would be working every day. My grandfather was George Ingalls who owned George’s Market in Ogden! It’s so nice to know someone has childhood memories of that store!